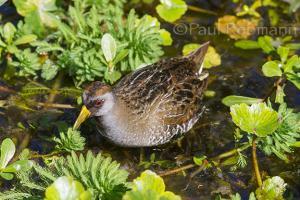 One of the more frequently seen rails is the sora. These small, thin, chicken-like birds inhabit both freshwater and brackish marshes and other wet places throughout Florida in the winter. The winter range also extends along the coast of the southern half of the United States, the Caribbean and all of Mexico. Soras migrate at night to breeding areas in the northern half of the United States and much of Canada. Soras have a thick, somewhat conical, stubby yellow bill and are mostly gray and brown with white edged feathers and greenish-yellow legs. The adults have a black face mask, that is paler in females and absent in juveniles. Soras (Porzana carolina) are also called Carolina Rails. You have probably heard the phase 'thin as a rail', that comes from the shape of rails as can be seen in the photo of the sora below. This slenderness facilitates their movement between the marsh vegetation, such as reeds, mangrove trunks and pneumatophores, or other plants. Another rail found in mangrove swamps and saltwater marshes of Florida, but more likely to be heard than seen is the clapper rail. They are larger than most other rails with a long slightly curved bill. Most of the body is mottled with the throat and belly smooth and drab. Birds along the Gulf Coast have some cinnamon coloring, especially on the belly while along the Atlantic coast birds tend to be grayer. They range along the east coast of the United States, Mexico and Central America plus the Caribbean. The clapper rail is one of two large rails found in Florida, the other being the king rail of freshwater marshes, although these species may sometimes overlap in brackish marshes. Until 2014 clapper rails were considered to be a subspecies of Rallus longirostris but now named as a separate secies Rallus crepitans. Rallus longirostris is now the mangrove rail of South America. The western subspecies of California, Arizona, Nevada and the western coast of Mexico is now Ridgeway's rail, Rallus obsoletus. This new species is named for ornithologist and artist Robert Ridgeway who first described the California rail subspecies. Ridgeway worked at the United States National Museum (Smithsonian) where he served as Curator of Birds from 1869 to 1929. Other members of the Rallidae family include coots and galliules, or moorhens. Coots are a small, dark duck-like bird lacking webbed feet with a conical bill similar to the gallinules and moorhens. The bills are white with a black band near the tip. They have red eyes and a deep red patch on the forehead, usually only noticeable at close range and/or good light. Coots (Fulica_americana) have a white stripe near their tail. Coots are a common bird of freshwater wetlands year-round throughout much of the Florida peninsula and the panhandle in the winter. The range includes most of the United States, year-round or winter in the southern states, extending into the midwest and Canada during the summer. Very similar to coots are the common gallinules. Also known as the Florida gallinule and until recently was more frequently called the common moorhen. Differentiated from coots by the white side body stripe, bright red faceplate and the 'candy corn' red beak with a light tip. Gallinules have large feet for their size which allows them to walk on top of floating vegetation. Gallinula chloropus is a common bird of freshwater and brackish marshes, ponds, lakes and canals year-round throughout all of Florida. The year-round range includes much of Mexico and the southeastern gulf coast up into North Carolina. Also isolated areas of the southwestern United States. Migration and breeding in much of the eastern United States up to the southern Great Lakes. Less frequently seen is the purple gallinule. Porphyrio martinica is a tropical marsh bird that is a year-round resident of peninsular Florida, Brazil, northern areas of South America, and parts of Mexico. The summer range expands along the southeast United States coast from South Carolina to Mississippi, most of Louisiana and eastern Texas. Purple gallinules winter throughout much of Central America. Purple gallinules have a dark purple head, neck and underside and a green back. The relatively large feet and long toes allow this bird to walk on top of lily pads and other water vegetation. They have a mostly red beak with a light tip and a blue face shield above the beak. These five birds are half of the Rallidae family occurring in North America, the other five all rails. Those are the yellow rail, black rail, Ridgeway's rail, king rail and Virginia rail.